Making $1,500 in charitable contributions to Rotary districts hit by natural disasters, including those affected by Hurricane Florence locally, by Hurricane Michael in Georgia/Florida and by the California wildfires. Donating 741 dictionaries to third-graders in 16 Richland District One elementary schools. Creation of a new Codified Policy for the club that’s a “standard operating procedure” resource for future leaders and committees. Collecting 58 units of blood at the annual Red Cross Blood Drive, each donation helping to save the lives of up to three people. Assisting five local college students with scholarships – current enrollees at the College of Charleston, Claflin University, the University of South Carolina, North Carolina State and Anderson University. Adopting a local family and providing gifts for the holiday season as part of the 2018 Midlands Families Helping Families Christmas program. Continuing community service projects with weekly Meals on Wheels delivery and annual volunteering at Harvest Hope Food Bank. 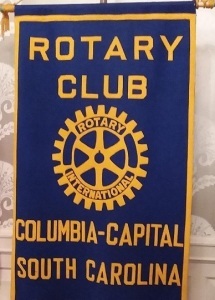 Supporting The Rotary Foundation with $242 per capita member giving that ranks among the top 10 clubs in District 7770. Serving as lead club for a Global Grant Project, partnering with the Rotary Club of Sunyani East in Ghana, Africa to construct the Nkrankrom Elementary School. Our club donated $2,500, District 7770 raised more, and with a Rotary Foundation match, Sunyani East was awarded about $94,000 to build the school. Publicizing our activities with 39 club website and social media posts; reaching over 2,700 people through social media; 1,643 website users; 38 postings on District 7770’s website and newsletters; 53 press releases posted by local media; and six monthly club activity recaps e-mailed to members.